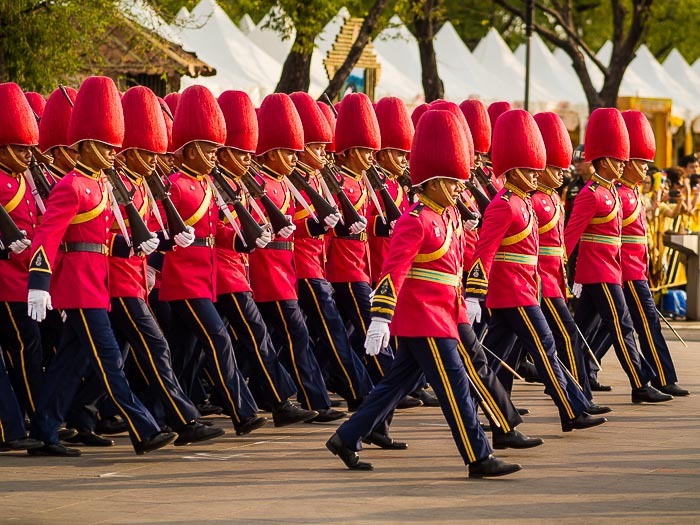 Soldiers march on Ratchadamnoen Ave during the Trooping of the Colours (spelled in the British style because it's based on the British tradition). December 5 is the birthday of Bhumibol Adulyadej, the King of Thailand. He was born in 1927 in Cambridge, MA. It's one of the most important public holidays in Thailand. 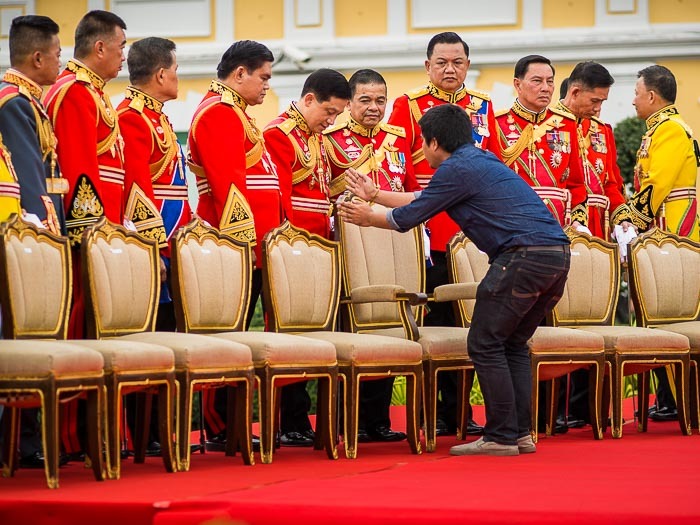 The reverence Thais have for their King is hard for Americans to understand. Until 1932 Thailand, then Siam, was an absolute monarchy. A military coup in 1932 made the country a constitutional monarchy and the King became the titular head of state but the country was governed by a non-royal government. Another unit marches in the Trooping of the Colours. The hats are reminiscent of the bear skin hats worn by British soldiers but they're made of plumes rather than bear skin. The current King was crowned on May 5, 1950 but has reigned since June 1946. He is the longest reigning monarch in Thai history. Now 86 (going on 87), he is in the twilight of his life and has been hospitalized, or under a doctors' care, almost continuously since 2009. Trips beyond the confines of the hospital turn into national events covered live on television. As he has aged reverence for His Majesty has grown. Thousands of people go to Siriraj Hospital every day to sign get well cards and birthday greetings for the King. Yellow is the color of the King (because the King was born on a Monday and yellow is Monday's color). Bangkok turns into a sea of yellow in the weeks leading up to his birthday. 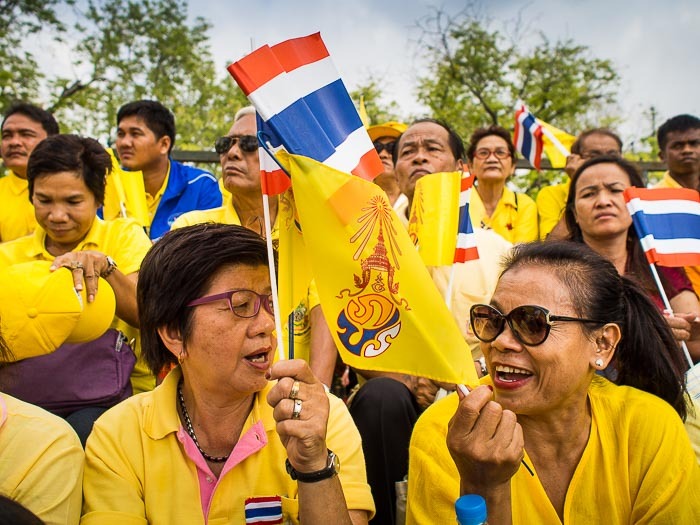 Spectators, all wearing yellow, watch the Trooping of the Colours on Sanam Luang. 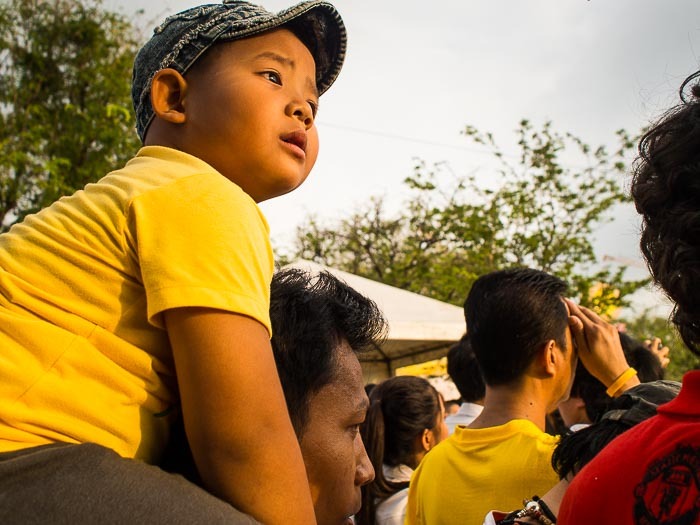 A boy sits on his father's shoulders to watch the parade. This year, Bangkok is going all in to celebrate His Majesty's birthday. There is a fair on the edge of the Sanam Luang with lots of food and cultural shows. 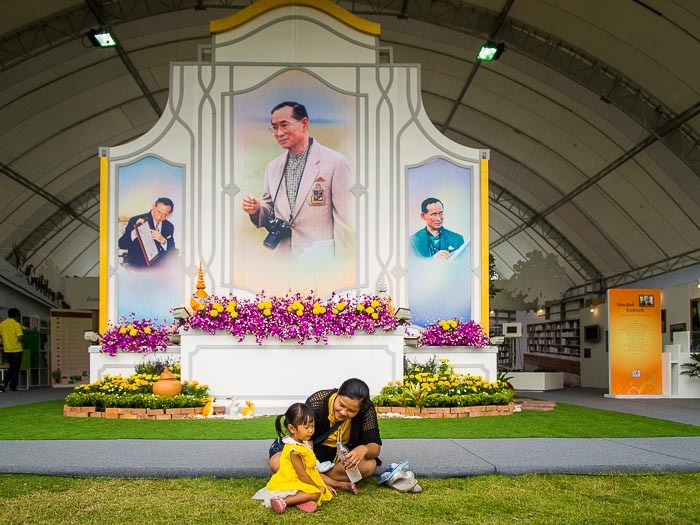 Almost every booth includes a display on the importance of the monarchy, most have a short multimedia on the role of the King in Thailand. A woman and her daughter share a bottle of water under a portrait of the King. 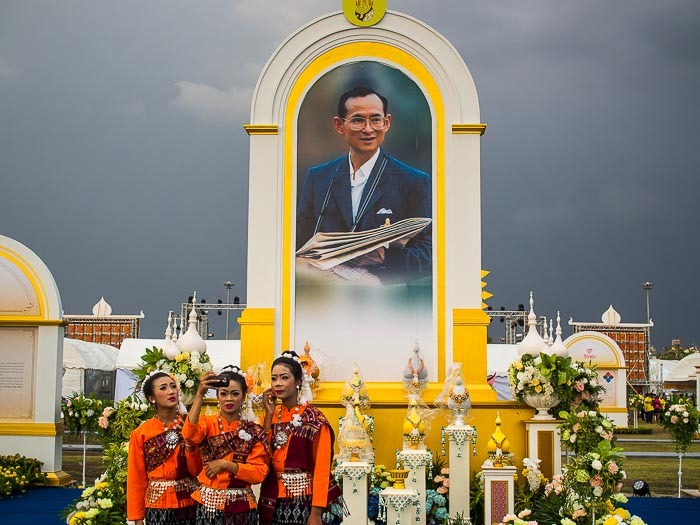 Women in traditional outfits pose for a "selfie" in front of a portrait of His Majesty. The Trooping of the Colours is a military event. Soldiers in very elaborate dress uniforms march through the old part of Bangkok and swear their loyalty to the King. In the past the parade was held on the Royal Plaza near Chitralada Palace. This year the parade was moved to Sanam Luang in front of the Grand Palace. Senior Thai military officers get together for a group photo in front of the Ministry of Defense building, opposite the Grand Palace. 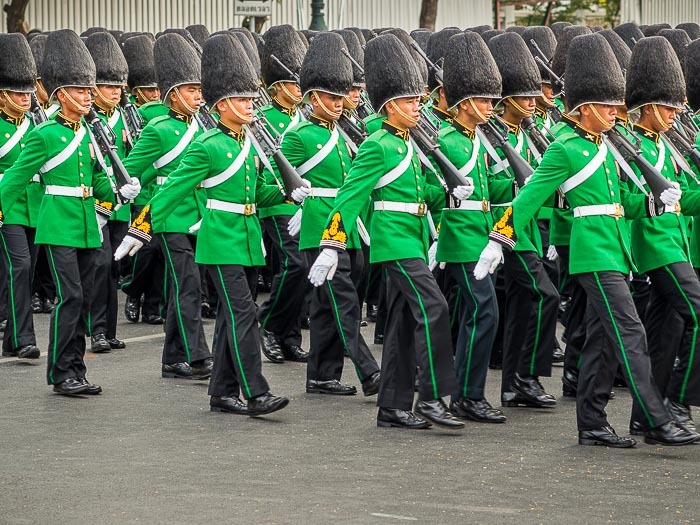 There are more photos of the Trooping of the Colours in my archive or available from ZUMA Press.